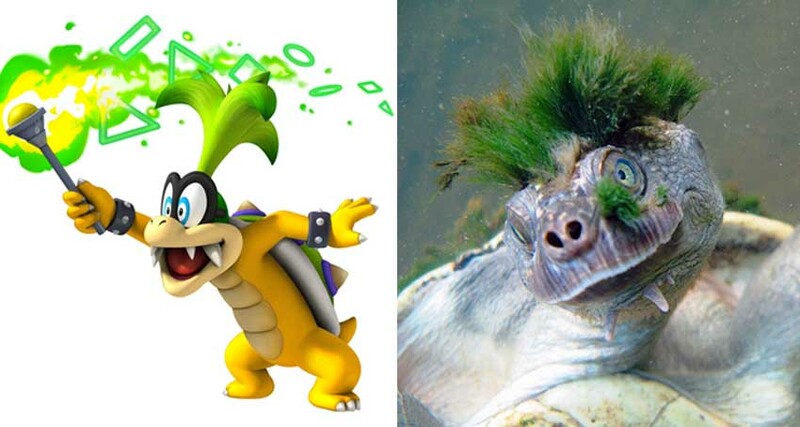 On the left, Iggy Koopa, and on the right, a Mary River turtle. Mary River turtles are named after the river they inhabit: the Mary River in Queensland, Australia. This is the only place that these turtles inhabit. 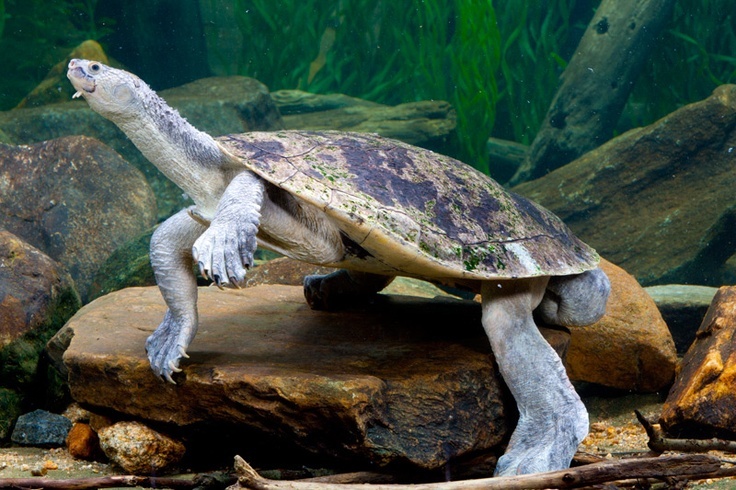 The Mary River turtle prefers areas of the Mary river that are fast-flowing, with a steady supply of oxygen. They are partial to areas with some kind of shelter, such as underwater logs or rock crevices. During flooding, Mary River turtles move upstream, heading to eddies or backwaters where the flow isn’t quite as fast. Once water speeds return to normal the turtles return to their normal habitats. Mary River turtles are quite unique; they are placed in their own genus, and are one of the only remaining turtles from a very ancient evolutionary lineage. These turtles are quite big, having a shell size of over 35 cm. They are usually dark brown or black, with a grey underbelly. They have very long tails compared to other turtles, with tail length exceeding 7 cm. One notable feature is Mary River turtles’ barbed chins, which makes them look quite tough. To add to their punk-rock look, Mary River turtles sometimes have algae growing on their heads, presumably to assist with camouflage. Another interesting feature of Mary River turtles is the bursae located on their cloacae. The cloaca is the turtle’s way of expelling urine, faces, and reproducing. The bursae located on the Mary River turtle’s cloaca act like gills, allowing the turtle to absorb oxygen from the water. They can’t get all their oxygen this way, however, and so still surface to breathe with their lungs every once in a while. Mary River turtles have very large back legs and streamlined shells, making them exceptionally good swimmers. Mary River turtles nest on sandy banks of the Mary River. Females are faithful to particular banks, and many turtles will use the same nesting site. One bank had evidence that over 100 females used the site to lay their eggs. Females lay 12-25 eggs per season, and usually lay from October to November. Once the eggs have hatched, the young turtles have a long road ahead of them: it takes around 25 years for a Mary River turtle to reach maturity. Until the 1990s, the Mary river turtle was not actually classified as a species. It was being sold in the pet trade, under the Common Saw-shelled turtle. Though biologists were curious about the strange turtle, they could not formally describe it, because the pet traders would not reveal the source of the turtles. Legal trade in the species was banned in 1974, but scientists still could not locate the habitat of the Mary River turtle. It wasn’t until 1994 that adult specimens were found in the wild and the species was named and classified. All and all, I think I have to declare the Mary River turtle one of my favourite turtle species. It’s just weird enough, with an interesting history and the right amount of silliness in its appearance. It’s my kind of turtle, that’s for sure!